OCD, PTSD, Compulsions and trauma are common occurrences in modern life. They are all forms of anxiety, but have different triggers, symptoms and treatment. Here is a quote from the International OCD Foundation that gives a feel for what it is like to have OCD. You don’t want these thoughts, they feel like an avalanche. Along with the thoughts come intense feelings of anxiety. Anxiety is your brain’s warning system, when you feel anxious, it feels like you are in danger. Anxiety is an emotion that tells you to respond, react, protect yourself, Do something! On the one hand, you might recognize that the fear doesn't make sense, doesn't seem reasonable, yet it still feels very real, intense, and true…. Underlying OCD are fears about oneself or others. These fears become obsessions that are constantly on people's minds. In order to alleviate the anxiety caused by these obsessions, compulsion develop. Repeatedly checking the front door is locked when exiting the property can mean going back to the door even after having walked up the street. Similarly ensuring car doors are locked repeatedly, this can mean coming back several times to check. Stepping on the cracks in the payment will make bad things happen. Ordering possession inside their home can spill outside and impact on others e.g. communal bin/washing areas. Experiencing ‘forceful will’ that the sufferer must shout out or say inappropriate things in a public setting, usually of a violent, blasphemous and sexual nature. Experiencing violent and harmful thoughts regarding other people in a public setting – this can lead to the sufferer following the person to whom they have had the thought to try and neutralise the thought. People with OCD tend to feel uncomfortable about their behavious because it is common to believe they are not really necessary. - "I know it is irrational, but..." - and yet the compulsion is strong. OCD is also often linked with feelings of embarrassment - and yet a sense of fear and responsibility still drives the compulsion to check, clean and ritualise. These conflicts often make OCD even more painful for the sufferer and, unfortunately the embarrassment can make it really hard to ask for help. 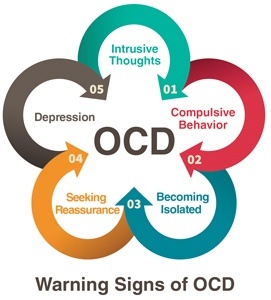 OCD is treatable, however, and if you recognise one or more of the above in your own behavior or the behaviour of your loved ones, or you recognise similar types of behaviours then you may want to seek the help of a professional. “A delayed or protracted response to a stressful event or situation (either short or long lasting) of an exceptionally threatening or long-lasting in nature, which is likely to cause pervasive distress to almost anyone”. Anyone who has experienced or witnessed a situation that involves the possibility of death or serious injury, or who learns that a close family member or friend has experienced a traumatic event, can develop post-traumatic stress disorder, although most people don’t. It’s still not completely understood why some people who are exposed to traumatic situations develop PTSD while others don’t. Common symptoms of post-traumatic stress disorder include reliving a traumatic event through nightmares, flashbacks, or constantly thinking about it. You might avoid situations or people that remind you of the event, have only negative thoughts or emotions, and constantly feel jittery, nervous, “on edge.”, and hyper-vigilance. Other symptoms may include drinking or smoking more than usual as attempts to reduce anxiety or anger, and aggressive driving. Service members who have experienced combat can be especially nervous driving under overpasses and past litter on the roadside — behaviour learned in Iraq and Afghanistan where insurgents hide improvised explosive devices in garbage and use overpasses to shoot at vehicles. Additional behaviour's that indicate that help may be needed can include being wary of crowds, showing reluctance to go to movie theaters, crowded stores, or nightclubs, and avoiding news that addresses overseas combat or getting angry at the reports. OCD and PTSD are toward one end of a anxiety scale. Toward the other end, people may have symptoms or behaviors that are similar to those of OCD or PTSD sufferers but are much milder. These are still treatable and if you feel they are interfering with your well-being and happiness then you should seek professional help. One thing to pay attention to is duration. Obsessions and Post Traumatic Stress are common to a certain degree especially after frightening events, but they should subside naturally. If they have continued over a period of months or longer then you should consider reaching out. There are various strategies you could try to help treat OCD and PTSD. Identify what goes through your mind when you become concerned about things. This could be a combination of vivid memories, and worrying thoughts about your vulnerability and likely danger. Take stock of your resources, particularly people who could support you. For OCD: Try to look at your thoughts - try to learn to reassure yourself by being able to weigh up just how realistic your fears are. Are you overestimating the threat and underestimating your ability to cope? For PTSD: Remind yourself that powerful memories are normal after a trauma: the brain is set to replay traumatic memories. Just understanding this can ease the stress and make the recollections less intense. When you are familiar with the sorts of thoughts and images that trigger your fears, use constructive, soothing self-talk to remind you that you are safe and that the danger is now over. Also try to develop soothing images of you coping and being safe. 5. Learn to gradually face your fears. 6. Reach out for help. The aim of all therapy is to get you to a situation where either the symptoms of OCD and PTSD have completely disappeared or where they have reduced to a stage where they are manageable and they no longer interfere with your life. This will involve the use of relaxation and stress reduction techniques, combined with some of the steps above to allow you to gradually face the situations that you have being finding difficult because they trigger memories and fears. Over time these and the associated symptoms will fade. If you think that you may like further assistance reach out to schedule your first appointment. OCD and PTSD aren't things you have to suffer from and we're here to support you. During your first session, you can share a bit about what's troubling you and I can answer any questions you might have. We'll discuss your goals and my approach and assess whether we are the right fit for each other. To schedule your first appointment, call 01733 639 040, email info@www.mentalwellnesscounselling.uk or use my online booking calendar to select a time suitable for you. I'm here for you.